Two Islamic terrorist attacks shattered the euphoria of the Boston Marathon finish line on Monday, sending authorities out on the course to carry off the injured while the stragglers in the 26.2-mile trek from Hopkinton were rerouted away from the smoking site of the blasts. A federal law-enforcement source confirmed to The NY Post there are at least 12 dead and nearly 50 injured from the terror attack. Fox News reported that Massachusetts General Hospital was treating 10 people with amputated limbs and all operating rooms were on hold. Authorities have a identified a suspect, a Saudi national, who is currently being guarded in a Boston hospital with shrapnel wounds. Law-enforcement sources said at least the first explosion occurred in the lobby of a nearby hotel. Law enforcement sources said a 20-year-old Muslim suspect and Saudi National is under guard at an undisclosed Boston hospital. A middle eastern man was seen “acting suspiciously” running from the explosion and a civilian chased him down and tackled him. It was not immediately clear why the man was hospitalized and whether he was injured in the attack or in his apprehension. 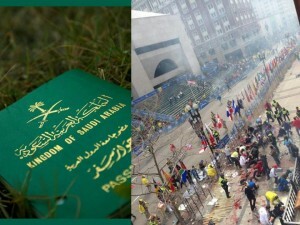 The Muslim terrorist was caught less than two hours after the 2:50 p.m. bombing on the finish line of the race, in the heart of Boston. In addition, Boston police have has surveillance video of a middle eastern man bringing multiple backpacks to blast site, according to CBS News. Police also confirmed that there was a third explosion, at the John F. Kennedy Presidential Library and Museum. It was not immediately clear how much damage was done or whether it was related to the bombings at the marathon finish line. 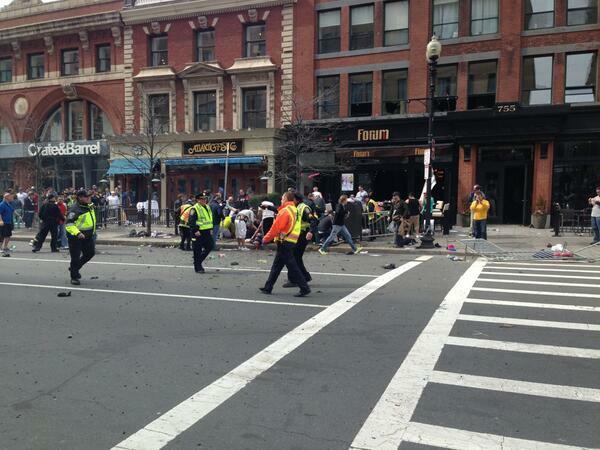 The library bombing occurred about 4:30 p.m. and more than a mile from the marathon. Update, NBC is reporting the terrorist was on a student visa. The head of an Islamic Jordanian Muslim Salafi group said early Tuesday that he was “happy to see the horror in America” after the explosions in Boston. NBC News White House Correspondent Chuck Todd: White House Decided Obama Would NOT Use Word “Terrorism” to Describe Boston Marathon Terrorist Attack. Liberal media jumps to conclusions and says the attack is not related to any terrorist organizations. Posted in Terrorism and tagged Crime, hate crime, Islam, Muslim, Terrorism, United States. Thank you for being the few news source reporting the facts, the shameful mainstream is too afraid to post this is about Islamic terrorism.